It was meant to be different and so it turned out to be. On 16 September the 26th Central European Dental Exhibition CEDE 2017 came to a close in Poznań. Around 11,000 participants attended both this festival of modern dental technology and the first ever Polish Dentistry Union Congress which was organised at the same time. The next CEDE will take place in a changed format on 20-22 September 2018. Four pavilions full of the products of exhibitors from both Poland and abroad, presentations of new innovations, participants learning about changes resulting from business acquisitions and company mergers, press conferences, debates, intense competition for the “Stars of CEDE” statuettes and, finally, a fantastic concert put on by Anita Lipnicka with her band – this was what CEDE offered over the course of three days in the Poznań International Fair’s “Four-Pack”. At the very same time and nearby the first ever Polish Dentistry Union Congress was held in pavilion 15, an event that included thematic panels, HOT-TOPIC discussions, sessions of scientific associations and dental organisations, presentations of the best student projects and doctoral and post-doctoral dissertations as well as practical workshops. A little further away, in the village of Przeźmierowo near Poznań to be precise, dentists learned a variety of procedures using human cadavers brought specially from the USA. The total attendance for all these events was around 11,000. In line with the ideas of scientific integration and integration between science and business, which have inspired us over these last dozen or so months, we are becoming more open to the notion of wide-ranging collaboration between all fields and disciplines of dentistry. Our hope is that the Polish Dentistry Union Congress will serve not only as a driving force for dental education in Poland, but will also help individual partners develop autonomously and achieve their goals. This setting, i.e. an exhibition of dental products, provides the best possible conditions for carrying out such a project. Scientific integration has helped identify those themes that are both essential to the development of Polish dentistry, and most importantly, are of practical value for the entire dental community: dentists, dental technicians, dental assistants, hygienists, students and apprentices. The Polish Dentistry Union Congress can be even better. I encourage you to help us prepare the event in the coming years. Good ideas, valuable comments and words of support and encouragement will surely help increase the prestige of the event, so that it can become a guiding light for members of the dental community and help them in their day-to-day professional lives. At CEDE 2017 we officially launched our campaign to promote among our participants the awareness of new competences and the opportunities they provide. We want people to come to Poznań with the understanding that only when modern technology is coupled with knowledge and practical skills can they be truly competitive on the market. This is the first stage of a project that we plan to implement over the next few years. For many reasons CEDE can no longer resemble the event from before Congress FDI 2016. The old format has to be mothballed since market changes demand it and participants’ own needs require it. Strength in this case lies not in quantity but rather in quality. Hence, we are pleased to learn from our key exhibitors that very specific guests began to visit their stands this year. Valuable scientific and clinical work is being done in our country in the field of dentistry. Ever more ambitious topics are being tackled in practically all areas of dentistry. Proof of this are the growing number of Polish publications with a positive impact factor appearing in international journals. The SHR session is further confirmation of this trend. What counts most in dentistry is the practical and innovative dimension of the research that is undertaken and this was evident even in the modest sample of 18 presentations from the SHR session. Especially pleasing to see was the collaboration between many young scientists on the one hand and various partners from industry on the other (e.g. the author of the winning doctoral dissertation) as well as with colleagues from other medical specialisations, as I observed in several post-doctoral presentations. The students exhibited a great deal of enthusiasm and energy, which is being channelled more and more effectively by their thesis advisors, and this in turn is being translated into higher quality presentations. These are indeed good presentations, with decent photographic documentation, and, most importantly, their authors are able to explain their work without resorting to notes. The new post-doctoral candidates will forge the scientific future of Polish dentistry. We must keep our fingers crossed and hope that they will now begin preparing and planning more valuable and innovative scientific research projects. I am a passionate advocate of developing and refining the idea of SHR. I think that we should be thinking of the most prestigious possible three-part prize for students, doctoral students and post-doctoral students, a prize which would be familiar to every dentist and which would carry weight in their CV. The winners of the first ever Stars of CEDE internet poll were iBAD (Be Active Dentist), the SEYSSO Oxygen O-Sonic Sonic Toothbrush (Shop Dent Wojciech Madej), Endostar E3 Rotary System (Poldent) and FEDESA ELECTRA 700 Ergonomic dental unit set (DENTALHOLDING Sp. z o.o.). The winners of the first ever internet competition in the history of Polish dentistry for popular dental products were announced on 14 September 2017 during a special Gala preceding Anita Lipnicka’s concert. Several months earlier, on 1 June to be precise, 40 exhibitors at CEDE 2017 entered a total of 56 products in four competition categories: Equipment, Materials, Prophylaxis and Education/IT. Voting took place exclusively via the website cedenews.pk on the final day – participants could also cast their votes at the competition stand located in the passageway between the pavilions where the exhibition took place. Popular products were nominated by dental branch representatives: dentists, technicians, assistants, hygienists, students and apprentices. 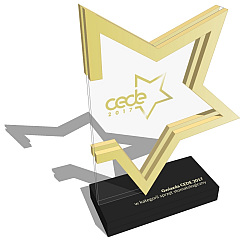 The winners were awarded the CEDE Stars statuette, a diploma and the opportunity to present their products on the Walk of Fame. The Polish Dental Association, the Polish Society of Paediatric Dentistry, the Polish Society of Periodontology, the Polish Association of Orthodontic Technicians, the Polish Medical Society of Radiology and the Polish Chamber of Dentists and Physicians, and Be Active Dentist – these organisations have shown that scientific integration makes sense. Join us today! • Scientific knowledge on an equal footing with practice. To ensure dentists want to come to the exhibition they must be convinced that it is worthwhile taking a few days’ leave from their dental offices. One factor that may motive them to do so is the opportunity to acquire knowledge at the highest level. Bearing this fact in mind, we are absolutely convinced that the exhibition and congress are events that can complement one another.